The following is a transcript of a speech I delivered to my Toastmasters club on 2 March 2017. It occurred to me a few days ago that all nuclear power facilities in the United States should have their own internal Toastmasters clubs, so that professionals can learn and practice communications and public speaking skills. Nearly six years ago, Japan was plunged into chaos. March 11, 2011. I was at a web-development conference in Chicago, staying with my brother-in-law’s family, when the news broke. At 2:46 in the afternoon in Japan, the deep-ocean fault-line off the east coast of Tohoku gave way, causing a mind-boggling 9.3 magnitude earthquake. Buildings and infrastructure were destroyed, and thousands of people killed. No sooner had the Japanese people started crawling out from the rubble, when a massive tsunami struck the coast. The tidal wave was 50 feet high or more, in some places. The videos of the flood waters roaring inland, taken by remarkably calm people on rooftops, are nothing short of surreal. Thousands more died in the flood waters, which then receded with nearly as much force as they had struck with. The final death toll from the quake and tsunami was nearly 20,000. Factories were devastated, refineries caught fire, and, of course, there was a major accident at a nuclear power plant. Normally, I would have gotten my hair on fire and started posting on Facebook about how awful and unsafe nuclear power is, as did most of my politically like-minded friends. This time, I decided to be more careful about my reaction. A friend had shared a link to a website called Brave New Climate, written by Austrailian blogger, Barry Brook. Barry was doing ongoing coverage of the situation, and I became riveted. And I learned some things. The Fukushima Dai’ichi generating station, and every other nuclear reactor in Japan, immediately went into automatic shutdown moments after the first rumblings of the quake were detected, exactly as designed. Although external power was lost at several stations in the areas with the most damage, on-site backup generators fired up and began supplying the electrical power needed to run the pumps that keep the reactors cool, so as to prevent meltdown. There was one little problem at Fukushima Dai’ichi — the backup generators had foolishly been placed in the basements of the reactor containment buildings. Although the plant, like all others, withstood the quake and the initial tsunami, the backup generators soon became flooded and inoperable, leaving three of the operating reactors with no ability to provide cooling to their cores. Water boiled off, and the tops of the cores became exposed. Hydrogen was generated by the radioactive decay and reaction of the fuel rod cladding with water. It began to accumulate in the upper levels of the containment buildings. The plant operator begged the Japanese government officials to be allowed to vent this hydrogen from the buildings before the situation became dangerous. The government insisted that mass evacuations be completed before venting the buildings, even though the wind was blowing out to sea and not placing anyone in danger. Eventually, enough hydrogen built up in the buildings that they exploded. You may have seen the videos of these buildings blowing up. What many do not realize is that these were NOT nuclear explosions. The reactors themselves did not blow up. However, the explosions did cause further damage to the facility, making it even more difficult to move portable backup generators onto the scene. Eventually the debris was able to be cleared, but by then it was too late to save the reactor cores. Three reactors melted down, and there is a long-term and very expensive process underway to clean up and decommission the power plant. • Just northward along the eastern coast of Japan, the Onigawa nuclear plant, nearly identical to Dai’ichi, was hit just as hard by the quake and tsunami, yet suffered no damage at all. It remains in a condition in which it could even be re-started. • Down the coast, the reactors at Fukushima Dai’ni did lose backup power for a short period, but it was restored in time to prevent any damage. • Finally, and most importantly, we need to remember how many people were killed by radiation from the damaged reactors. Any guesses? —— The death toll from radiation remains stubbornly at…. ZERO. Now, I do not mean to imply that the situation in Japan alone is what caused me to rethink my opposition to nukes. The incident is simply what started me on a path of self-education. Because of something a friend shared on Facebook, I decided to check what could have been a knee-jerk reaction to a very bad event. Reading Barry’s blog led me to information about issues other than the disaster. • I learned about fast breeder reactors, including the Integral Fast Reactor, which was designed to run on reprocessed used fuel from conventional reactors. The IFR project was about two years away from commercial demonstration when the funding was cut by Congress in 1994. • I learned about many other people who were writing about nuclear power. I began following dozens of fascinating sources. • I learned about how two of the three European nations — France and Sweden — with the lowest carbon emissions accomplished that by using lots of nuclear power. • And I learned about just how few people have in fact been killed in the history of nuclear power. Almost all of them were at Chernobyl, and that number was less than 100. Not a single person has been killed in the United States in the history of our nuclear industry, other than a handful of industrial accidents, which can happen in any industry. Not a single person has ever been killed in the United States by radiation from a commercial nuclear power reactor. In fact, in terms of fatalities per terawatt-hour of energy produced, nuclear power has the lowest death rate of any means of electrical generation humankind has ever invented. And that, fellow Toastmasters, is how the disaster at Fukushima helped me, a left-leaning environmentalist concerned about climate change, learn to stop worrying and love the reactor. On 16 February 2017, the Indiana Senate Utility Committee voted to advance an amended “Distributed Generation bill” (SB 309) to the full Senate for consideration. I do not feel that SB 309 should be passed as currently written and amended. My advocacy is not for solar and wind and other “renewable” sources of generation. I advocate for progress and advancement in nuclear technology research, development, and deployment. That said, I also feel that all low-carbon sources of generation should be welcome at the table, and encouraged. SB 309 effectively eliminates the provision of “net metering”, which means that customers who install their own methods of power generation, and are connected to the electrical grid, are able to sell their excess production back to the grid. In the strict sense, “net metering” means “running your meter backwards”. What this amounts to is that customers who generate excess electricity are able to sell that power back to their provider at retail prices (the same rate they pay for it when they are drawing from the grid). Rooftop solar, for example, is something that I feel should be encouraged and, to some degree, incentivized, as it does provide some benefit to our electrical system by distributing generation and serving point-of-use and time-of-use supply. Consider this scenario: I have a backyard full of chickens. (No, I really do. about 36 birds right now.) The hens lay eggs. and when they really get going later in the season, they produce more than we can deal with. I can sell those eggs. We have a local health-food store that sells locally grown produce, including eggs. They usually sell local eggs for about $4 per dozen. If I offer to sell my excess eggs to this store, and I ask $4 per dozen — the same price that this store will resell them for — do you think they will be at all happy about buying from me? Of course not! They will politely tell me to take a hike! Still, although I am not convinced that retail-rate sell-back (strict “net metering”) is the optimal solution, an outright ban on any kind of consumer incentive — or requirement that consumers who invest in rooftop solar may only sell at wholesale prices — is the optimal solution. The Indiana Legislature should defeat this bill, do a comprehensive study, and come up with something better. I understand that you are a supporter of advanced nuclear power. So am I! As we (well, some of us) work toward carbon reduction and mitigation of climate change, nuclear will become an even more important part of our low-carbon energy mix. We cannot afford to leave it off the table. My question is this: as a supporter of nuclear power, are you willing to take a larger leadership role in bringing more progressives on board? The left in general seems to have come down against this technology, but there are many of us who, if not currently supportive, are at least willing to listen to reasonable arguments from “one of our own” on the issue. Thank you for your service, and for showing that progressives who stand up for our values and principles can win even in an unfriendly year like this one has been. As an engineer (BSEE, University of Kansas, 1988), I generally support the proposed new EPA regulations on carbon pollution for electrical power generation, with the exception of the rules concerning the contribution of nuclear-powered generation. In particular, the accounting of nuclear power in the calculations of CO2 output, as proposed, makes no sense to me, from a scientific, engineering, or mathematical standpoint. The contribution of existing nuclear-powered electricity to our supply should be treated equally, by including 100% of its output in baseline CO2 generation calculations — no more, no less. States in which new nuclear plants are being constructed should not have those plants included in existing production calculations, but rather those plants should be included in calculations of CO2 reduction targets. Those calculations should include 100% of that new production — no more, no less. A production facility that generates electrical power with a low carbon footprint by using nuclear power should be treated the same as a facility that does the same via solar, wind, hydro, efficiency programs, or any other means. Low-carbon is low-carbon. The objective of the EPA carbon-reduction rules should not be to favor one technology over another for any other reason than their comparative abilities to accomplish the specific goal of reducing such emissions. Technology tribalism – my technology is better than yours, so I will oppose yours – should be abandoned. 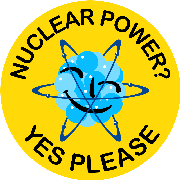 via Why we should support nuclear power – Comment – The Ecologist. My support for nuclear does not mean I have a problem with your solar panels. Luke Currin does not want us to write off Energiewende as a failure. Okay, I’ll refrain, but I think he would agree that it could use some improvements. The irony is in the solution proposed: “IHS estimates Germany could meet 30 percent of its gas demand if it fracked.” Yup, we’ll make up the shortfall from shutting down a huge low-carbon source by… fracking and burning natural gas. Those who consider climate change a top priority praise Germany for their leadership in taking action to address it. Those who downplay the implications of climate change, as well as those who value short-term economic prosperity over long-term environmental stewardship, condemn the effort as yet another example of failed government policy. False dichotomy. There’s a third option: Some who consider climate change a top priority see clearly that Germany could 1) drop their utility rates to a more affordable level, and 2) go a long way to achieving the low-emission goals of Energiewende by turning all those shuttered reactors back on as soon as possible. There are a lot of people in Washington — a lot of lobbyists and a lot of politicians — who are determined to block any new laws that might reduce pollution. Year after year, evidence grows about the damage we suffer from carbon pollution, and yet, the science deniers stay locked in place. It’s so bad that we can’t even have a serious conversation about the growing evidence that the earth is in real trouble. If we don’t do anything at all to stop climate change, what do you think the world will look like 25 years from now? Monday night, several other senators and I are pulling an all-nighter on the floor of the Senate to talk about the importance of pollution and climate change. We are going to do our best to bring attention to a topic that a lot of people in Washington don’t want to talk about. I’ve been assigned a block of time to talk, and I want to spend a chunk of it talking about as many stories as I can from people like you. A future with no or very limited use of fossil fuels is simply imperative, and one way or another, we will eventually have exactly that. Such a future without nuclear power as part of the energy mix, however, will not look like the “solartopia” promoted by many dogmatic environmental purists. Instead, that future will look a lot more like Mad Max — and we will never find Tomorrow Morrow Land. If you care to share your own thoughts with Senator Warren, whether or not you also received the invitation, I am sure she would welcome your input. About halfway through the S&S article, I started getting a feeling of deja vu, as if I had already read it. Looking back at the Turner one, I realized that although the unnamed writer had said “according to Stars & Stripes…”, they had then proceeded to lift nearly an entire section and present it as their own, with no indication that they were quoting or excerpting directly. They were also very selective in which portions they lifted and which they ignored. I’m afraid this has left me rather unimpressed by the Turner piece and the level of journalistic integrity displayed. The S&S article was more balanced, in my opinion, and less conclusive. Not saying that the truth is “always in the middle” (the truth is where it is), but it gave a broader range of perspective and I thought it was much more responsible coverage. There was an enormous amount of debris, much of it extremely toxic, washed out to sea by the backflow from the tsunami. At least one coastal oil refinery burned for days, releasing unfathomable amounts of pollution into both air and water. Possible ill effects from that contamination should be investigated as thoroughly as those that may be due to radiotoxicity. Not that TEPCO didn’t make mistakes or were entirely forthcoming with information, but in this case they are the easy target. That is no way to get to the truth of what really happened. Excellent move, UK Lib Dems! Now, could you come over and explain your good reasoning to our “liberal” Democrats here in the USA? As my recent ebook Nuclear 2.0 showed, if we try to eliminate nuclear power globally at the same time as rapidly growing energy consumption, we head straight into the territory of catastrophic global warming with mathematical inevitability. On the other hand, if we deploy a new generation of safer, cheaper nuclear plants on a worldwide scale – combined with an ever greater rollout of solar and wind generation – the world still has the option of keeping global temperature rise within 2C this century. via Lib Dems’ nuclear U-turn shows they realise we can’t say ‘no’ to everything | Mark Lynas | Environment | theguardian.com. Shutting down a nuclear power plant with twenty good years left in its bones is not progressive. I would even suggest that it’s regressive. And why go into decommissioning status when they could sell electricity at about 5-cents a kWhr and fuel costs less than a cent of that? For short-term profits, of course. It’s not like these companies would lose money, it’s just they wouldn’t make as much. And that is so much more important to America than energy security or reducing CO2 emissions, or keeping jobs. When Should Nuclear Power Plants Die? – Forbes.